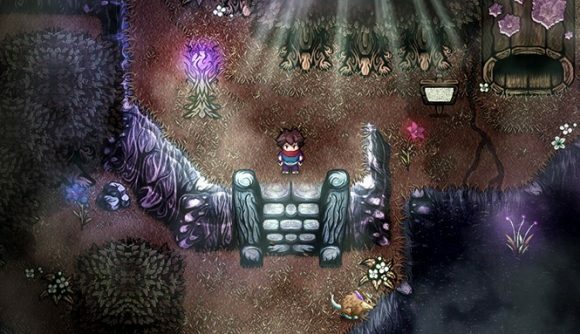 Last year, we noticed a little indie JRPG called Koruldia Heritage seeking support on the Square Enix Collective, the company’s independent games incubator that worked a bit like Steam’s defunct Greenlight program. Now its developers are taking to Kickstarter to raise the remaining funds for their quirky passion project. Koruldia Collective looks at first glance a bit like a high-gloss RPG Maker project, but as you can see from the slick new trailer below, there’s quite a bit more going on here. You can explore as you see fit, crisscrossing the strange, alien world to uncover new areas – or dive into other characters’ memories. Like Undertale, combat can sometimes be resolved peacefully, and in some cases you’ll wind up befriending the enemies you once squared off against. Based on the trailer, it seems as though the game shifts perspectives a lot, too – going from the Mode 7-style JRPG visuals of Chrono Trigger to the classic turn-based fights of Final Fantasy to the hand-painted environments of some of the classic adventure games. Here’s the trailer – have a listen to that score, it’s fantastic. Koruldia Heritage has a pretty modest Kickstarter goal – the team is hoping to raise £10,000 over the next month to finish off development. But they’ve got some really neat stretch goals and backer rewards for generous donors – hitting £20,000 and £40,000 will guarantee additional content, and backers who pledge £100 or more get to have their faces appear in Game Boy style pixel art on one of the game’s Memory Cubes. Koruldia Heritage is well on the way to hitting its first goal, and assuming the project gets backed, the developers expect to have the game ready in September 2020. If you’re into pixel art, this is definitely one to keep your eye on.